The whole family was together. Lounging around the family room enjoying each other’s company… Sort of. I surveyed the ridiculous scene. The talking heads arguing about the news of the day in high-def. Husband stretched out in the recliner, Kindle Fire in hand, scanning an e-book while awaiting his next turn of Words With Friends. Son propped in the corner of the sectional, intently focusing on the practice test app on his iPhone, one ear-bud in his ear played his favorite song. Daughter on one end of the sofa was checking her calendar on her iPhone and texting her friend to make plans while scrolling through her Facebook feed. Son-in law, sprawled out on the floor, was looking up the stats of the baseball game with his iPhone while waiting for his email to update. And I, at the other end of the sofa, had also been mesmerized by the screen of my iPhone, studying the dinner recipe while waiting for water to boil. My laptop next to me open to my current Photoshop project. Everyone slowly looked up. Seconds later, we all burst out into a roar of laughter. It was rather comical but quite pathetic. However, If I’m being totally honest, this is not an entirely uncommon scene around our house. We are a digital family. An iPhone loving, Kindle reading, laptop using, blu-ray watching, big screen, high-definition, surround sound family. We love the latest technology and put it all to great use, but we love each other so much more. We appreciate the value in the multitude of tools available in this online, techno driven lifestyle; but we also understand it’s dangers. We know when it is time to unplug… Usually. For me, that time comes when my mind is spinning from information overload, and I realize, ironically, I am not actually absorbing much of anything. I know that these tools that have such potential to help increase my performance all the while keeping me connected to the ones I love, can actually be a hindrance to production and an interruption in my relationships. 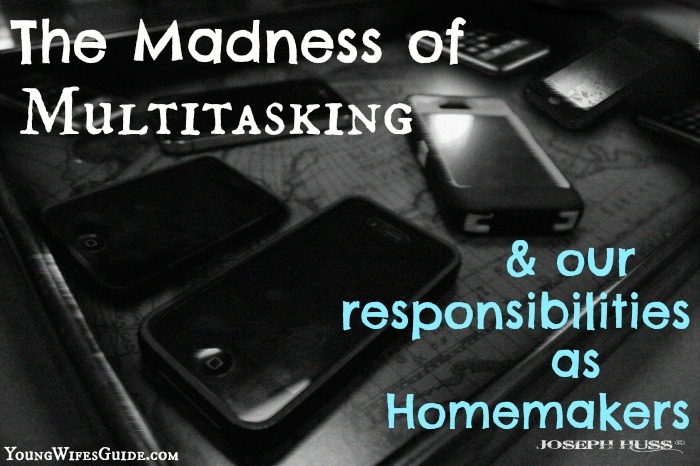 As women, especially homemakers, we have to have some basic multitasking ability. There is not a day that goes by that I am not washing laundry while doing the dishes while cooking dinner. Throw in a conversation and a lousy night’s sleep, though, and something is sure to get burned, broken, or forgotten. The fact of the matter is that we are not as skilled at multitasking as we would like to think we are. With all of our fancy technology, we have the capability to have fifteen+ things vying for our attention at any given moment, but we are unable to focus on any of them strongly enough to learn something of value or make real progress. It all becomes a bunch of meaningless distraction… White noise. The problem is that we are not meant to multitask, and there is extensive research that shows us that we are actually wasting more time.